You’ve been dealing with a noticeable gap right in the front of your smile since your adult teeth came in, oh-so-many years ago. Although braces might have been a good option when you were a teenager, now that you’re a busy adult with professional responsibilities – and a penchant for giving stellar presentations at work – a mouthful of metal just won’t do. But what other options do you have to close the gap and give you the perfect grin you’ve always dreamed of? With porcelain veneers in Longmont, you can achieve the beautiful results you deserve. Learn more about this innovative treatment option from your premier cosmetic dentist in Longmont, Longmont Complete Dentistry. As your trusted oral healthcare professionals, Drs. Dan and James Maurer explain that veneers are thin, yet durable shells of porcelain that are permanently affixed to the front side of your teeth. Our team will start the process by discussing the results you’d like to achieve, and then we’ll prepare your natural dentitions to have the veneers places. We’ll remove a small amount of your existing enamel and then take impressions that will be sent to a lab that will create your permanent cosmetic upgrade. We’ll place temporary veneers that will look and function just like your natural teeth while the lab custom creates your permanent solution. Once the veneers have been created, we will use a dental bonding agent to affix the permanent veneers. What Issues Can Veneers Address? Gaps & Alignment Issues – If you have gaps or minor alignment issues, porcelain veneers can give you the perfectly straight teeth you’re worthy of without using traditional braces. Discolored Teeth – Since you get to choose the shade of porcelain and bonding agent, you can make your teeth as radiant as you like. Veneers are especially great to address complex staining from medications like tetracycline antibiotics. Short Teeth – Many people have some teeth that are shorter than others, and veneers are a great way to add length and ensure your teeth make proper contact when chewing. 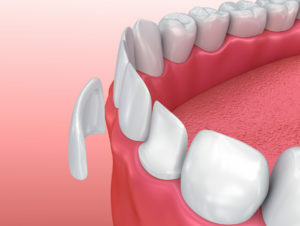 Misshapen Teeth – It’s incredibly common for teeth to vary in their natural size, shape, and appearance, and veneers are an excellent solution to correct the way your dentitions are formed. And, since porcelain veneers are both stain-resistant and can be cared for just like your original teeth, these are truly a solution that are as convenient as they are beautiful. Now that you know how porcelain veneers can give you the smile you’ve been longing for, schedule your appointment with Longmont Complete Dentistry today to close the gaps and makeover your grin!